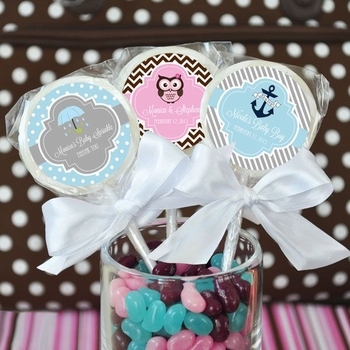 Indulge your guests� sweet tooth with these strawberry-flavored party favor lollipops. They�re available in a wide variety of whimsical images, bright colors and attractive patterns that matches the theme and d�cor of your event. Included with the favors are personalized labels including names, dates and/or messages that add a unique flourish in expressing your appreciation to your guests. Each white lollipop favor is ivory curled in color and delightfully wrapped in clear cellophane packing with a white satin bow. See More Images above for other pictures and design choices.